Did you know wild birds will refuse to eat spoiled food?! Storing your wild bird food correctly is just as important as only buying good quality seeds! Wild birds need to consume a large amount of food throughout the day to meet the needs of their active lives for them to survive, therefore many birds have come to rely on the food we provide in our gardens. It is essential that we provide only highly nutritious foods and it is our duty to ensure the food we provide is as fresh as it can be and safe for them to eat. The cooler the better to preserve the life of your wild bird food; garages with concrete floors are more suitable than timber sheds if you do not want to store your food in your house. Timber sheds will heat up rapidly during the day, particularly in summer, this temperature fluctuation will quickly deteriorate the quality of seeds and increases the risk of mould growth. Bacteria thrives in damp conditions, even a small amount of moisture will spoil your wild bird food. Any food that you suspect may be at risk of damp must be discarded, as mould and mildew could be fatal to your wild birds. Food that has been damp may be clumped together and will have a musty smell. Pest such as rats and mice carry diseases, so it is important to keep your wild bird food in strong plastic or metal containers with tight fitting lids to prevent contamination which could harm you and your wild birds. Pests will also eat large quantities of food and they will return for regular feasts, so to discourage pests in your area ensure you are vigilant when storing any food, particularly if you keep your food in an outbuilding. 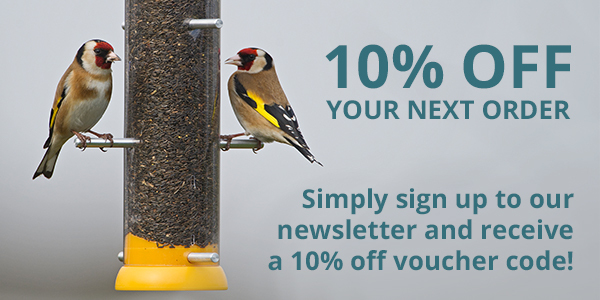 Although buying wild bird food in bulk can be cheaper, try not to buy more than a three-month supply at a time. This will ensure freshness and limit the risk of bacteria growth. It is important to ensure old food is removed from any storage containers before you replenish your supply with fresh food, this prevents the old food from spoiling the fresh food. Ideally give your container a clean and ensure it is fully dry each time you refill it with fresh food. If you are storing food for more than a few months then every time you refill your feeders give your food a stir to prevent it from becoming stagnant. We do our very best to ensure our food is as fresh as it can be when you receive it. We buy all our stock as we use it so we don’t store any food for long periods of time ourselves. To help you keep your wild bird food in best condition we only sell our food in quantities up to 5kg to ensure the food you buy is easy for you to manage and store effectively. Peanuts are essential to keep fresh due to the risk of aflatoxin that can occur. Only put out in your feeders enough peanuts that will be eaten within a week, and discard any uneaten peanuts to help keep your garden birds safe. We ensure all of our peanuts are aflatoxin tested and stored appropriately before sending them out to you. Suet should be kept away from direct sunlight and heat, particularly in the warmer months of summer to promote freshness. Even though our Suet to Go suet blocks are suitable for summer use as they will not melt, it is important that you keep an eye on them for mould growth to help protect your garden birds from harmful bacteria. If you have any further questions then please don’t hesitate to contact us!